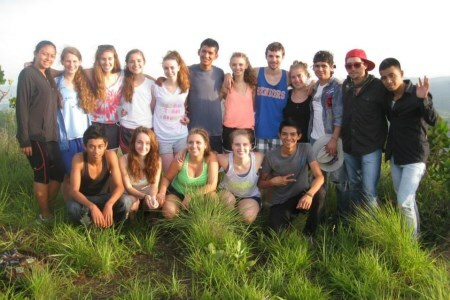 Why Did I Go To El Salvador? 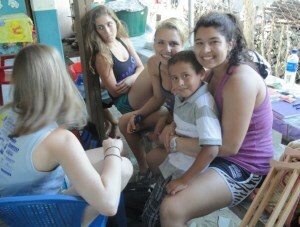 by Hannah FlammWhy did I go to El Salvador? I wanted to know people from another part of the world; I wanted to help people from another part of the world; I wanted to live like people from another part of the world. Why did I return from El Salvador? They made me. I didn’t know what I was getting myself into by going on this trip. I had no experience with building and I would be building a school. I didn’t know anyone in this community and I would be living in their homes for two weeks. I expected an extra-fulfilling camp experience in a different language; I got the most thrilling and outlook-changing time of my life. As our rickety bus plowed through the dirt-and-rock road that leads into Hacienda Vieja, Cristina, our guide and mother yelled, “photo op!” I raised my camera up over my head and took pictures. (I couldn’t stand up for the luggage and dogs under my feet.) Only later did I look at those pictures; the kids holding signs welcoming, blessing, and thanking us; the older men nodding and smiling; everyone’s eyes emitting love, expectation, and joy into each member of our delegation. We got off the bus and hugged. The feeling that I was important to these people who didn’t even know me yet, the knowledge that we could hug after having only glanced at each other for a moment, only grew during the trip. When else have I spent two weeks (even two days) when all people say hi with their mouths and hearts, when all children are adorable and loving and try to help you carry cinderblock and 5 gallon bottles of water, when all adults will teach you and include you and respect you and trust you? When else? What did we do in Hacienda Vieja? We put up the walls for a CEDI, the school for 2-7 year olds. Noel and Elba, the teachers (and my best friends), currently teach the 25 to 45 kids who attend the CEDI on the porch of Elba’s mother’s house: every morning Noel and Elba put out desks and chairs; every afternoon, they put them away, and every school day the kids are cramped in and easily distracted. 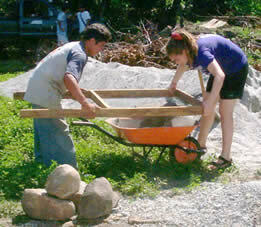 The trip was about more than shoveling dirt, mixing cement, and placing cinderblock. The trip was about exchanging hand sanitizer and energy bars with kids who gave me paper prizes from their bags of Ranchitas snacks. The trip was about listening to personal stories and community histories and feeling a connection with the people, their pride, and their sufferings. The trip was about building my second home. This year will be about waiting to go back. 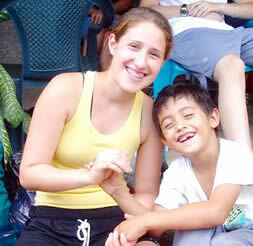 Hannah Flamm was an International Partners Teen Delegate in 2004 and 2005. In 2006 and 2007, she served as a Team Leader. In August, 2007, she assumed the role of Communications Coordinator. She is now an attorney working in New York and a member of the International Partners Board of Directors. This piece was written after her first year as an International Partners Delegate.